We finally did it! 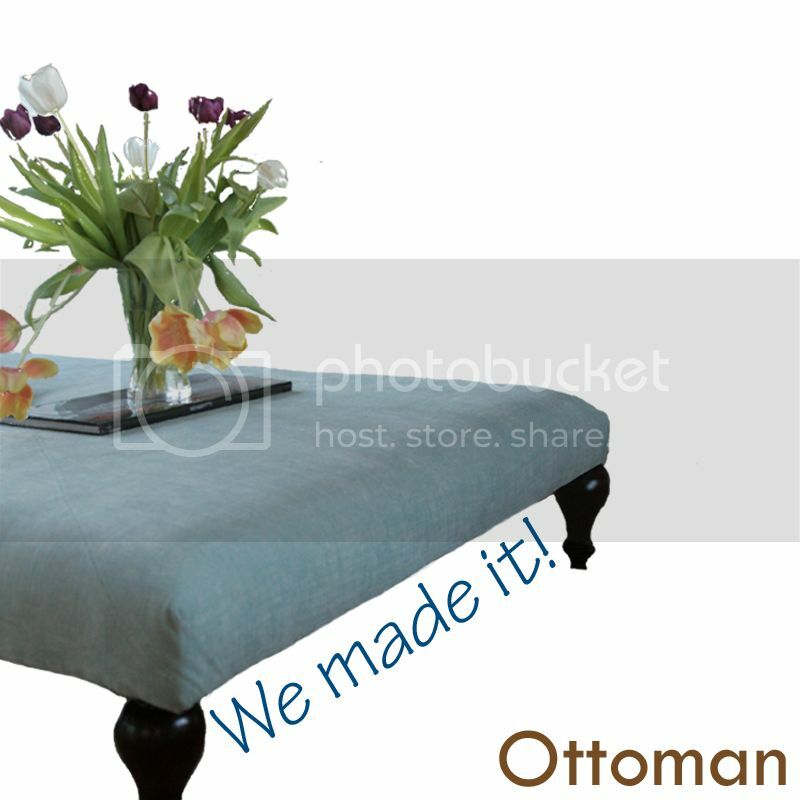 A full year after we built the frame, we actually finished the oversized ottoman for our living room. Spoiler…it’s not recycled, nor is it repurposed. Why did it take a year? Well, that’s how long it took me to finally commit to a fabric and find the right legs. When my Swedish man helped build the frame last year, we actually had a fabric to put on it…that was too short to go all the way around – this despite being on the phone with my husband while at the fabric store to get the measurements from him to be sure. Does that ever happen to you? Doesn’t he realize that fabric can’t be returned if it doesn’t fit? And my first intent to recycle legs from a piece of thrift store furniture flew out the window after several months of searching. Do you know how hard it is to find turned wooden legs in the land of clean Swedish design? It’s 1 year worth of hard! So I finally found a nice small business in Scotland with crazy good prices and had a box of legs sent over. The poor thing sat dejected on piles of books in the middle of our living room for 1 year! And let me tell you, when you have two kids under the age of 10 who seem to believe that our living room is their own personal gymnastics facility, those books didn’t have a chance. We were constantly lifting up the ottoman to restack those books underneath. Does it kill me that I wasn’t able to get some recycled or repurposed features in it? Sure. But I also know that my design style is a funny blend of second hand, new, and repurposed. And when I look around at the furniture pieces in my living room, this is the only new piece…and we made it! It’s not even store bought. We got exactly what we wanted – an oversized ottoman that could serve as a coffee table, extra seating, a foot rest for everyone who visits, and a gymnastic vault for the kids. I love it! BUT…I don’t think it’s actually done yet. I’m actually toying with the idea of painting a design on the fabric. The pattern choices are marinating in my brain and we’ll see if anything comes of it. I’m thinking darker blue swirls or square-ish shapes ‘stamped’ on with a DIY screenprint-style stamp on recycled styrofoam a la The Meta Picture. What do you think? Do I dare? I have some extra fabric to try some sample work beforehand, so that reduces the risk a bit. 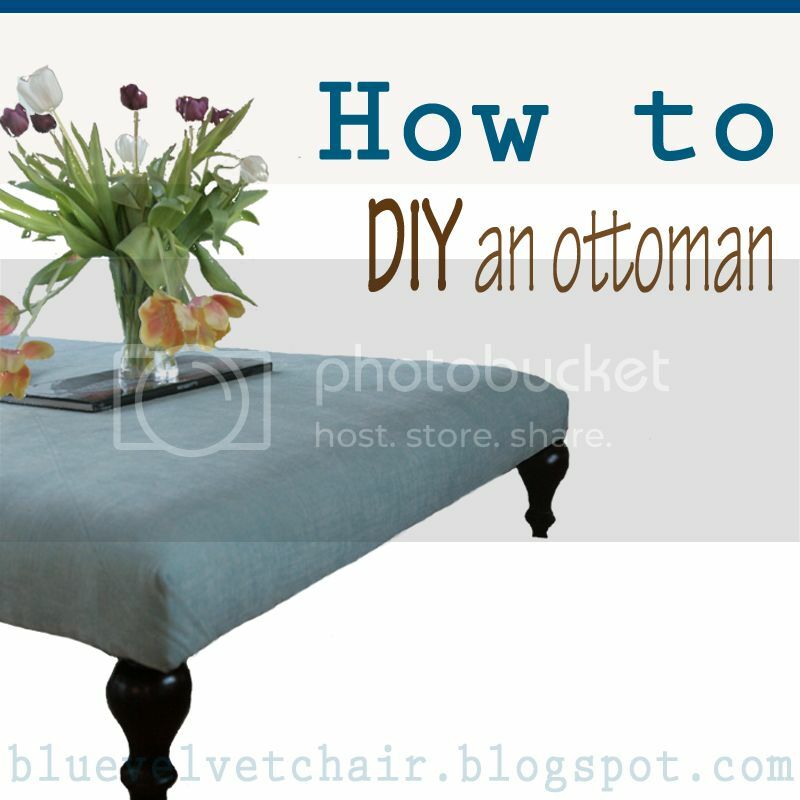 Interested in making your own ottoman? I’ll tell you how we did it later this week. 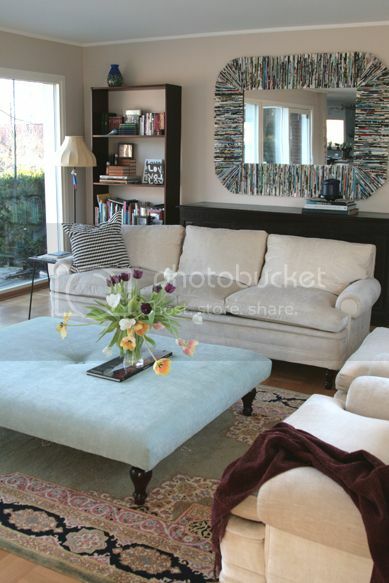 And if you are like me, you enjoy peeking into other’s houses to see their design style. So I thought I would also create a post this week with a little tour of our living room, including some ‘before’ pics when we moved into the house over 3 years ago. Our remodel process is slower than I’d like, but I’ll start posting some mini tours so you can have a peek around. Yeah, I really didn't think that finding legs to recycle was going to be as impossible as it was. Shame, really. I'm definitely going through an oversized stage right now…wondering how long I can make it last. Jessica – great project! I've shared it with our Facebook readers today. I hope others will also try one for themselves. I didn't do any special tufting or anything, just stapled the fabric on and moved on. I was kind of tired of dealing with it so I just left it alone and figured I could fix it later. I also used plain square table legs to make it a little more modern, but now that I've finished it, I may change that out for a fancier leg. Yes, you CAN do it! I totally understand about the 'getting started'. We started…and then it took a year to get started again! Wow, this thing is LOVELY! I love the fabric, I love the legs, I love the size…..I love it all! Great job! I have an oversized coffee table I'm thinking of turning in to an ottoman, which in my case would just involve picking fabric and then assembling it, since it's already a table. I wonder if I could talk the hubby in to it? 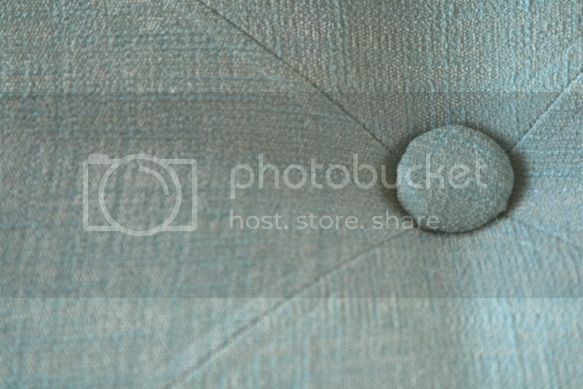 I have been thinking of doing my own tufted ottoman. I think it's just so hard to get started. This looks amazing. Thanks for the inspiration and push to believe that I CAN do this! Excited to see your tutorial on how you did this! LOL – Jamie, I have to admit that I've been holiding off on showing any of my house. Our house was built in 1971 and when we moved in it needed the obvious renovation (which has gone slower than I had hoped due to the cost of things over here in Sweden, not to mention fewer DIY choices). And, although it's a bit embarassing to admit, I have been a little intimidated of showing it because of all the breathtaking houses out here in blogland. Don't get me wrong – I'm very happy and at ease with my own 'eclectic traditional' style, but I constantly second guess my choices. All that said, I know how much I love to look around the rooms in other's photos…so I'll be offering up the same in these coming months. Thanks for giving me the boost. Nancy – Thank you! I'm so happy with the size – it is divine-ly big! Jodi – those are too kind words coming from another creative! Thanks! Looks fantastic! The color and size are great in your room. WOW! It looks terrific in your living room and compliments your beautiful mirror. Wow Mike, I really love the end result. The color is great in there too. I think you are going to have a hard time stamping the fabric because it is so soft. Well done, that was a labor of love! Jessica – do you have a pic anywhere? Or can you post on the Blue Velvet Chair Facebook page? I'd love to see it. Did you change fabric after the 'unexpected' dye result? I actually just finished building my own ottoman as well, so I'm interested to see how you did yours different. I had the same problem with the fabric… I couldn't find what I wanted so I bought white and attempted to dye it and, as expected, it didn't turn out the way I wanted. Luckily my search didn't take only but 2 weeks, but still… the frame sat in my garage for about 3 weeks before I finally got it finished on Saturday.